Kenneth Lee is a freelance writer currently residing in Orange County. He has been published in university-level publications as well as third-party contracting. Lee specializes in the medical field, but like anyone has hobbies all across the map. He is a Doctor of Pharmacy candidate at the University of the Pacific, Thomas J. Long School of Pharmacy. The Subway Meatball Marinara Sub is a customer favorite, especially because it is one of the few hot subs on the $5 Footlong menu. The main components are the Italian-style meatballs that simmer in a marinara sauce. This article focuses on the 6-inch version of the sandwich. If ordering a Footlong, simply double the nutrition facts. The serving size of a 6-inch Meatball Marinara sandwich is 372 grams, the largest of all of Subway's offerings. This includes lettuce, tomatoes, green peppers and onions. The choice of bread is optional but nutrition facts are based on a choice of nine-grain wheat bread. A 6-inch Meatball Marinara sub sandwich contains 580 calories. When measured up against a standard 2,000-calorie diet this 6-inch sandwich is equal to 29 percent of the daily recommended diet. Of the 580 calories, 200 calories come from fat. This is equivalent to 23 grams of fat with 9 grams being from saturated fat and 1 gram being from trans fat. The Subway Meatball Marinara sandwich also contains 45 milligrams of cholesterol. 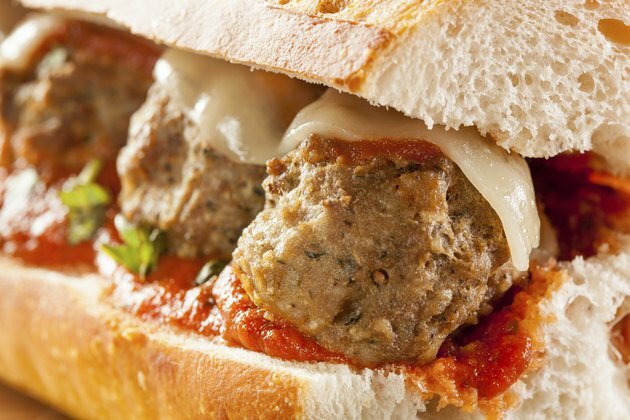 The Meatball Marinara sandwich packs 1,530 milligrams of sodium in a 6-inch serving. In a 2,000-calorie diet this makes up almost 41 percent of the recommended daily intake. The sandwich also contains 16 grams of sugars. While most of the carbohydrates come from the bread in most Subway sandwiches there are other ingredients that contain carbohydrates as well. The Meatball Marinara contains 70 grams of carbohydrates. This is the highest number of the sandwiches on the menu. Protein can be primarily attributed to the meatballs themselves. The Meatball Marinara sandwich contains 24 grams of protein. This can be translated to 48 percent of the recommended daily protein intake. The Meatball Marinara sandwich draws dietary fiber from many of the ingredients involved. In fact, with 9 grams of dietary fiber it once again tops the chart for the sandwiches on Subway's menu. Dietary fiber can aid with digestion and the passing of food. Vitamins and minerals are measured based on a percentage of the recommended daily intake based on a 2,000-calorie diet. The Meatball Marinara sub contains 40 percent of the recommended daily amount of vitamin A, 45 percent of vitamin C, 20 percent of calcium and 25 percent of iron. How Many Calories Are in a Subway Sandwich Bread? How Many Calories Are in a Piece of Cheesecake From the Cheesecake Factory?